Picture yourself living in a gated community on the edge of one of the most beautiful lakes in Central Florida. There’s daily access to boating and fishing, as well as quiet spots to experience the thrill of watching wildlife enjoy the water. Not only that, but you can use the pool, fitness center, and clubhouse as much as you like. In addition, our clubhouse offers a lakeside observation deck with seating that’s great for quiet contemplation or cozy chats with neighbors. 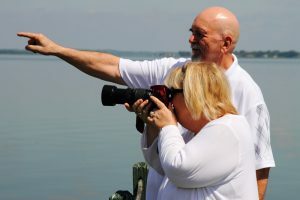 What’s more, when you decide to explore outside our beautiful gated community, you’ll find that nationally acclaimed beaches, theme parks, sports venues, nature parks, and historic sites lie close enough to make easy day trips from your comfortable home at Lake Griffin Harbor. If you’re looking for a gated community in Central Florida that offers security and plenty of activities to keep you busy, you’ll find it at Lake Griffin Harbor. Contact one of our Lifestyle Consultants today to schedule a tour.